Liberal Democrats senator David Leyonhjelm will quit federal politics next month to contest the NSW state election. The move sets pits Senator Leyonhjelm against one-time Liberal Democrats member and former Labor leader Mark Latham, who is running for One Nation in the state’s upper house at the March 23 election. The crossbench senator was first elected to the upper house at the 2013 federal poll and was re-elected at the 2016 double dissolution election. Senator Leyonhjelm told Sky News on Monday night he is making the switch because he wants to work on ‘nanny-state issues’. ‘Red-tape issues are the ones that really annoy me and get up my nose,’ he said. The legalisation of cannabis will also be an election issue for Senator Leyonhjelm. ‘I think there’s much more hope of achieving that at the state level,’ he said. The senator last made headlines in December when he made a controversial speech about migrants in parliament, thanking ‘young brown men’ for delivering his groceries, pizzas and online purchases as he praised the men for ‘not whinging about a brown pay gap’. 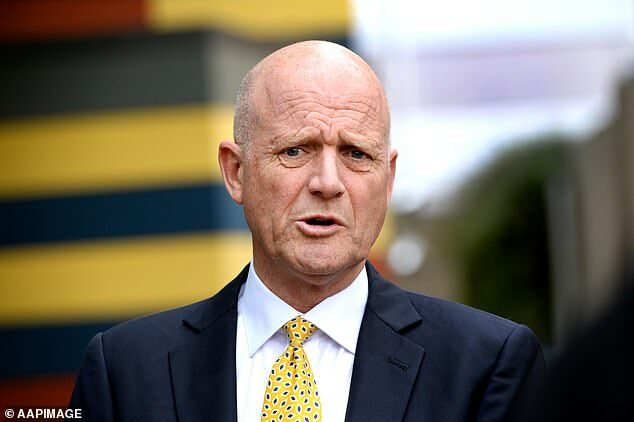 Senator Leyonhjelm said he wanted to use the speech to give thanks to ‘a group of Australians who may be ignored or worse but who make a great contribution’ to the nation. ‘Let me say thank you to Australia’s young brown men,’ he told parliament. ‘The young brown men I come across in my day-to-day life are often in low-paid jobs. They drive me in their Ubers and taxis. They deliver my online purchases, my groceries and my pizza.